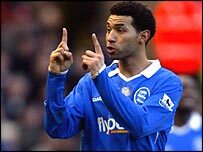 Jermaine Pennant has signed a three-year contract with Birmingham and completed a £3m switch from Arsenal. The 22-year-old midfielder, who has been a success since joining the Blues on loan, made the move permanent after falling out of favour at Highbury. Birmingham stood by the former England Under-21 star when he was jailed for drink driving offences in March. And a statement on the club's official website added: "The club also has a further one-year option on Pennant." Blues boss Steve Bruce said he had high hopes for Pennant. "Anyone who saw Jermaine play at Everton on Saturday will understand why we have been trying to sign him for the last six weeks. "Without question he was the best player on the pitch at Everton. "He is at the right age and is British with all the right ingredients to make it to the top." Pennant thanked Bruce for his faith and support. "It had been very frustrating at Arsenal and the decision to join Birmingham on a permanent basis was due to the opportunity to play regularly," he said. "The other reason was the backing I've had from manager, Steve Bruce. "This meant a great deal to me while the fans and all the players and staff have been great. "It was easy to agree to sign for Birmingham because the club is great with a lot of good players. "With the signings already made it shows the club want to go places and hopefully we can be a force next season and qualify for Europe." Pennant arrived at Highbury for £2m in 1999 from Notts County and scored a hat-trick on his first Premiership start. But he failed to establish himself in the first team and had loan spells at Leeds and Watford. Pennant was convicted of drink driving offences last season and received a three-month prison sentence when he offended again in January.